that's just fabulous: Get The Glow! With a bit of encouraging from Ashlyn I snagged the St. Tropez Bronzing Mousse and paired with a few other essentials I'm feeling way more prepared for short season than before. Below are the steps I've used to get a nice bit of glow sans sun (along with one must have for those times I do get to hang by the pool). St. Tropez Bronzing Mousse : This is definitely one of those items I was a bit on the fence over. I never wanted to look like I fake tanned (streaky, orange, staining clothes etc) especially since I'm no pro on application. This mousse has definitely changed the game for me, it couldn't be any easier to apply and leaves the most natural bronzed glow. Along with the mousse I snagged the mitt - which is such a pain that it is sold separately, but oh well it's definitely necessary. Before applying I took a shower, exfoliated, and moisturized (definitely, definitely moisturize first). I began with my legs and worked my way up. I started with one pump for the front of my lower leg and one for the back, applying in long circular movements. I payed extra attention to my kneecaps and the back of my knees. I moved up to my torso, chest, neck, and then each arm. For the arms I made sure to pay extra attention to my elbows and places where my arms bend. After my body was finished I went back and with the leftover mousse on the mitt I went over the tops of my feet and hands. I slept in pants and a t-shirt that night but didn't notice any staining on anything. In the morning I hopped in the shower to rinse off and voila - gorgeous, glowing skin! To maintain everything I make sure to exfoliate and moisturize. Chanel, Les Beiges : Since I was wary of putting the St. Tropez on my face (there's no warning against it, I just didn't want to risk breaking out) I've been using the Chanel Les Beiges tinted moisturizer. This product is amazing for giving an all-over dewy glow. It's lightweight, the coverage is good, and the color is spot on. Tom Ford Shimmering Body Oil* : This is more of a fun extra step than anything (especially at night), but it enhances a tan beautiful and smells like summer. This oil distributes a good dose of shimmer in once spritz, dries down quickly, and highlights bronzed skin like a dream. Adding a bit of this on the collar bone and shoulders is the perfect accessory for a night out. Drunk Elephant SPF 30 : Last but not least, I couldn't do a tanning post without adding a SPF in. This SPF is loaded with antioxidants and free from parabens, sulfates, and phthalates. It's great for sensitive skin and keeps you from feeling greasy. It has UV benefits and also anti-aging benefits - really a win/win for when you are spending time in the sun itself. Along with all the good stuff inside the sunscreen contains a small trace of shimmer, leaving behind a gorgeous glow after application. Do any of you use any of these products? How do you go about getting that perfect summer tan? Let me know in the comments below! 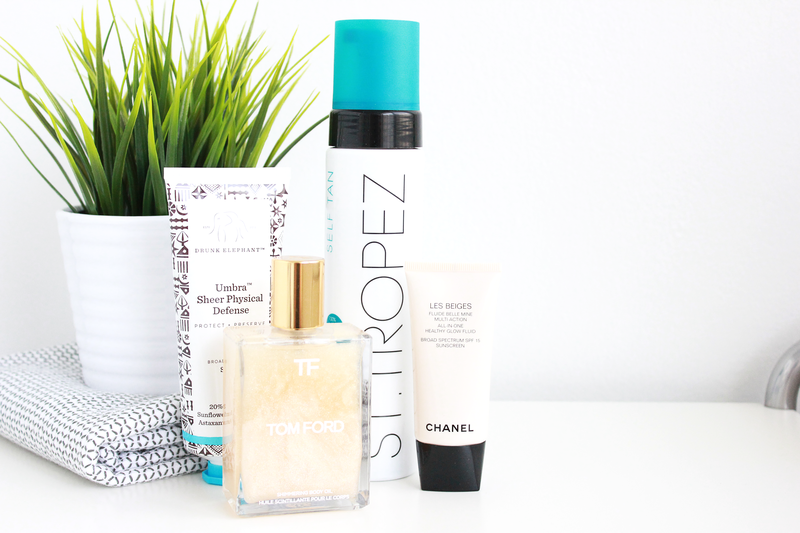 St Tropez just cannot be beaten for self tanner. I want to add a few more of their products to my collection - I'm super impressed with the bronzing mousse! The shimmer oil sounds amazing, and so luxurious! I've totally been on the fence about the St Tropez but I think you just won me over! Thankfully I'm heading to the beach soon, but I'll probably pick a bottle up after the trip to keep the glow (or burn, either way)! It definitely luxurious, I especially cannot wait to use it while on vacation this summer! Definitely worth it! Such different results from other lotions and things I've used in years past! So jealous of your upcoming beach trip!! I just heard rave reviews about a new tanning product, NKD SKN, and using the beauty blender body sponge, the application looked easier than easy! It was the first time in my life I have considered self tanning! I am horrible about laying out... I am the one that ends up with the crazy tan lines, or I get really impatient. These products all sound like great alternatives! I've never heard of NKD SKN! Are they using the little pink beauty blender to tan the whole body? Or is this just for face? I didn't know Dove made a gradual tanner! I'll have to look into that. I bet that would be a great option to use to help maintain the St. Tropez mousse! It's more of a hand sized 1/2" flat sponge that you can use. It's not as popular as the pink teardrop shapes blender but it's really great for covering a large amount of skin at once!